This homily was delivered by the ever-memorable Metropolitan Vladimir (Sabodan), the predecessor to the current primate of the Ukrainian Orthodox Church His Beatitude Metropolitan Onuphry, on the day of his own patron saint. 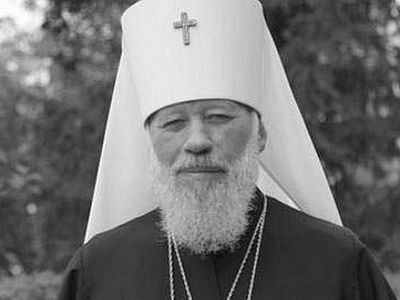 He served as a bishop in Christ’s Church from 1966, and as the primate of the Ukrainian Orthodox Church from 1992 until his repose on July 5, 2014 at the age of 78. By God’s grace, every country and every people, and often cities, have an enlightener in their history. The Lord has raised up His elect from among the people, and through them has enlightened His people with the light of faith. Rome glorifies Sts. Peter and Paul in praise, through whom it came to believe in Jesus Christ, the Son of God; Asia, Ephesus, and Patmos—St. John the Theologian; India—St. Thomas; Egypt—St. Mark; every country, city, and people honor and glorify their mentors who taught them the Christian faith. The holy apostle Paul commands us: Remember them which have the rule over you, who have spoken unto you the word of God … and imitate their faith (Heb. 13:7). Heeding the holy apostle’s call, we glorify and bless today the enlightener and baptizer of Rus’, the Equal-to-the-Apostles Grand Prince Vladimir. The all-merciful eye of our good God looked favorably upon Prince Vladimir, and wisdom shone forth in his heart; he understood the vanity of idolatrous delusion and sought the one God Who created all things visible and invisible. He was ignited in spirit and desired with his heart to be a Christian and to convert his entire land to Christianity. By the grace of God’s love for mankind, it was fulfilled. 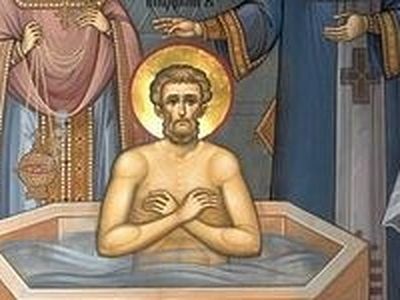 Having entered the holy font, Vladimir was reborn of Spirit and water, and commanded all his people to be baptized in the name of the Father, and of the Son, and of the Holy Spirit. Our land began to glorify Christ with the Father and the Holy Spirit from that time. The light of the Gospel enlightened our land, destroyed pagan temples, and erected churches; the Cross blessed the city, idols were cast down, holy icons appeared, the bloodless Sacrifice began to be offered up, and incense, rising up to God, sanctified the air. Prince Vladimir is a complex historical figure. In his face we can see ourselves today as in a mirror, with all of the complexities of our characters and the mutability of our behavior, with all our fits and falls. The Lord deigned to choose precisely such a person, to fully manifest in him the miracle that the holy faith works with people. What did the Christian faith give to Prince Vladimir and our country? The sinful and wild pagan Vladimir became God-fearing in character. His conversion to Christ was genuine, intimate, and deep. The transfiguration of his character and his break with sin were remarkable. “Thou didst find Christ the Pearl of great price, Who chose thee like Paul and enlightened thy blindness of flesh and spirit at the Font,” the Church sings of him. The holy faith changed St. Vladimir and helped him to hear the word of the Lord spoken to King Nebuchadnezzar by the prophet Daniel, and to order his life according to this word: Atone for thy sins by alms, and thine iniquities by compassion on the poor (Dan. 4:24). Alms to the people gave him great boldness before God as an eternal servant of Christ. The words of Scripture confirm this for us: Mercy rejoiceth against judgment (Jas. 2:13); Blessed are the merciful: for they shall obtain mercy (Mt. 5:7); He which converteth the sinner from the error of his way shall save a soul from death, and shall hide a multitude of sins (Jas. 5:20). If the Lord renders such a reward for the conversion of one man, then what blessedness has Prince Vladimir found?! After all, he did not convert only himself to Christ, but as the prince and leader he took care for the conversion of his people. From him, as from a flaming fire, the fires of faith were kindled in the hearts of his people. Faith cleansed the people from the deep delusion of idolatry and changed their human morals. The Christian faith is the cradle of our national culture. The faith laid a foundation for our writing, painting, and architecture. The faith brought humane principles to the life of our people, to families, and to society. The faith that the Lord gave us through Prince Vladimir was a worthy sowing that brought forth worthy fruits of the Spirit. It glorified a host of saints—our fellow countrymen, who intercede before God for our land, for our holy Church, and for our people. 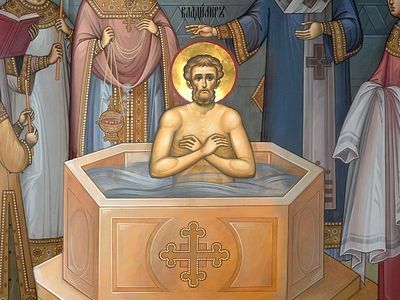 Blessing the enlightener and baptizer of Rus’ the Equal-to-the-Apostles Grand Prince Vladimir, our constant intercessor before God, let us, brothers and sisters, preserve the Orthodox faith and build our lives according to the Gospel. This all demands labor and effort, but God is with us, Who has given us the priceless gift of faith and helps us to grow to the measure of the age of Christ. The help of our intercessor the Equal-to-the-Apostles Prince is with us. In order to keep the faith, knowledge alone is not enough. You can know the Sacred Scriptures and its sacred commandments well and still be a bad Christian. A true Christian is he who adds ecclesiastical experience and a true Christian life to knowledge about the faith, about God, and about the Church. Let us pray to the all-good God Who illumines and sanctifies every man that comes into the world that by the prayers of our enlightener the holy Prince Vladimir, He would strengthen our faith and help us, defeating all that is vain, sinful, and worldly, to be worthy children of our holy Church and Fatherland, and heirs to life eternal. From the troparion to St. Vladimir—Trans. Wherein Lies the Moral Power of Holy Prince Vladimir? St. John (Maximovich) of Shanghai and San Francisco Wherein Lies the Moral Power of Holy Prince Vladimir? The demise of His Beatitude Metropolitan Vladimir of Kiev and All Ukraine is a bitter loss for the whole Orthodoxy and, of course, particularly for the Church of the Holy Rus’. I call all her faithful children to pray ardently and zealously for the repose of the soul of the deceased archpastor with saints in the heavenly dwellings, for the orphaned Ukrainian Orthodox Church, for the peace in Ukraine, and for the Ukrainian people undergoing hard times.